Who’s Coming Up on Monday, March 27? Monday, March 27, 7 p.m. to 9 p.m.
Congratulations to the 63 audience members who made it to the entire series! It’s been a great season with some out-of-the-box performances, some new faces and some old favorites. Hawaiian music is not just one thing, and this season exhibited that very clearly. All the presenters took to heart the season theme of Music is Our Kuleana. 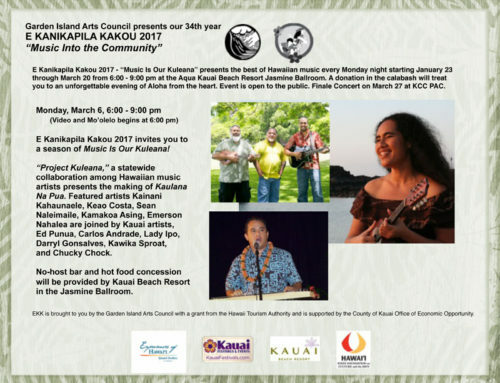 Mahalo for your participation and we look forward to presenting our 35th Anniversary of EKK in 2018. Mahalo, also, for celebrating 40 Years of GIAC with us, bringing ARTS to the people and people to the ARTS. “Can we ask them back every year?” came a request from several of our regulars, referring to Kupaoa, the couple comprised of Kellen Paik and Lihau Hannahs Paik. I’m not sure if the audience is affected by the “sweet, lingering after scent” of Kupaoa, which is what their name means in Hawaiian, or just because together they are so darn fabulous. They are truly an EKK favorite, because every show they bring has new music, different stories, fun stage banter, beautiful harmonies, plus unique style of singing, and always top-notch performances. It may not be easy for musicians who spend a lot of time performing to keeping it fresh … but they do! For the past two years, they gifted the island with a free Kilauea-based Christmas Concert that brings the whole town of Kilauea out. Folks from all over the island travel to Kilauea and sit under umbrellas in pouring rain to enjoy their show. Many Kilauea residents attended this final Monday of the EKK 2017 season. They even rode to Kilauea in a yellow school bus. Now that’s what we call hometown support! Wahine ‘Ilikea, composed by Dennis Kamakahi, was the opening number. It’s one of Kupaoa’s favorites of the hundreds of songs composed by Uncle Dennis. They’ve been busy introducing new recordings to their repertoire by adding songs written earlier but just now recording them. It seems that 15 years ago in a haku mele, or songwriting class at UH Manoa, Dr. Puakea Nogelmeier, master of poetry and their instructor, told the class to put away all their reference books and spend 30 minutes writing a new song. Lihau has affection for the lehua blossom of the ohi’a tree that to her represents new life and rejuvenation, as it is the first plant to bloom anew on fresh lava. She titled the song He Aloha No Ka Lehua. It has only now surfaced as a new song for their latest CD, titled Ho’okele. Puni Badis of Eva Beach, one of their original hula dancers and an instructor for the hula circle held in the first hour, danced to this new mele. She was stunning, wearing a red and gold hula dress, haku lei around her neck and a whole garden of flowers atop her long black hair. Puni and her husband Kepa, their two children and the two grandmothers of these keiki made this trip a family vacation — how sweet is that! Kepa made all the fabulous floral head dresses for the two dancers and also made me a very special haku lei with fragrant honohono orchids. Felt like a queen all night! Uluwehikalunaoka’ala, one of their most beautiful songs and a winner of the prestigious Haku Mele award at the Na Hoku Hanohano Awards, was composed in 2009 for a friend’s wedding. It describes the groom’s vision of seeing his bride’s silhouette in the archway, backlit and surrounded by an aura of sunlight. This song and the couple that got married are all tied in with how Kupaoa came to be. Kellen’s version is that he wanted three female singers with him doing the backup music and musical arrangements, but after two rehearsals, the other two ladies left the group and Kellen was left with this girl, Lihau, who played no musical instruments except a piano. Lihau said, “The other girls had lives, we had no lives.” Kellen ended playing at the wedding but Lihau was in law school and had an exam that day, so she missed playing at the chapel. She was, however, able to play at the wedding reception later that day. Six years later, Lihau and Kellen make up Kupaoa and definitely have a life together; some things happen not by chance. According to the above story, Kellen and Lihau first met at Puni and Kepa’s wedding many years ago, but have been together as Kupaoa for 12 years. They first came to EKK in 2009, the last year we held EKK at the Island School cafeteria, where they nearly filled the house to max capacity with their 252 fans. Since that first appearance, they have won the Most Promising New Artists award at Na Hoku Hanohano Haku Mele Awards; produced many CDs; and are among the most in-demand musical performers in the state. Eight years later, they are every bit as fresh and fun and their singing is just as fantastic. They stand when they perform and they know their songs by heart. It makes a world of difference in their performance. They did a shout out to Loui and Yumi Cabebe who designed their matching outfits. Kellen shared a bit of nostalgia about the late Uncle Bill Kaiwa who grew up at Kipu Kai Ranch behind the Ha’upu mountain range. He was educated by some of the best Hawaiian language musicians and composers of his generation, flown to Kaua’i by his hanai father, George Waterhouse. Uncle Bill spent a lifetime traveling the world and sharing his songs, many of them from the 1800s. In order to not lose these songs, Kellen and Lihau accompanied Dr. Puakea Nogelmeier every Monday night to visit Uncle Bill, have dinner and play Hawaiian songs. Kellen’s job was to record the sessions with his laptop and recorder. They learned many songs from Uncle Bill that might have otherwise been lost. Prince Lelei’ohoku was the youngest of four royal siblings known as Na Lani Eha, who passed away in his mid-twenties. Lili’i Mokihana, tiny mokihana, composed by Lelei’ohoku was recorded on their newest album. The only other person who recorded this song was Bill Kaiwa. As a child growing up in Kilauea, Kellen recalls going into Kong Lung Store and not being able to buy anything in there. He spent a lot of time looking at the old plantation photos and blurbs about the pictures. Although Lihau is the song composer in their team, she challenged Kellen to compose a song for the Bumbye album. He came up with a song about Kilauea, titled Kaulana Kilauea, famous is Kilauea, that they recorded on their Bumbye album. To Kellen, his garland of pua onaona are all the people who made Kilauea special to him. 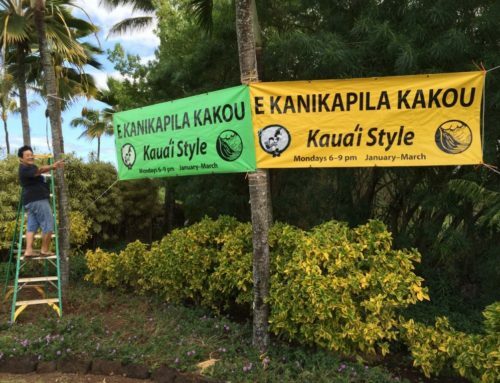 All four of the Ke ‘Ala Aumoe Dancers — Matt Del Rosario, Puni Badis, Kumu Hula Frank Ka’anana Akima and Kumu Hula Eleena Helenihi – shared the hula about the little town on the north shore. Three years ago, with a Hawaiian music band called Kaulana that hails from Osaka Japan, Kupaoa recorded a song titled Na Pua Mohala after the CD of the same name. The song, also known as Hana wa Saku or Flowers Will Bloom, was written about the 2011 destruction in the Tohoku/Sendai/Fukushima area where a tsunami destroyed thousands of acres of farmlands as salt water swept over the entire area. This forced farmers to move to the city after generations of farming. 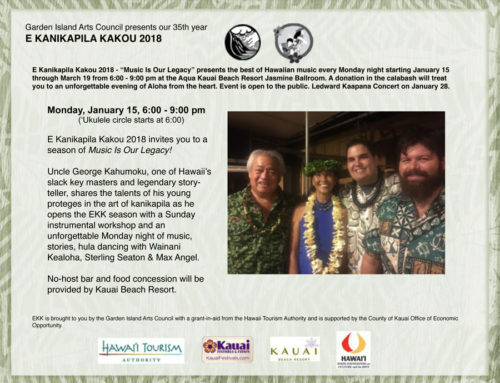 When Kupaoa performed in Japan, the most memorable performance for them was in the old folks’ home where about 30 seniors were in tears, appreciative that people from across the ocean were singing a song about their plight. The EKK audience was also very moved by this beautiful song written from the Hawaiian perspective. The harmonies and sentiments were haunting. Another new/old song on their Ho’okele album came about as Kupaoa worked with the old Hawaiian newspapers saved by the kupuna who threw nothing away. In the late 1800s, anybody could write and submit anything to the newspapers, including gossip about the personal lives of others. This made newspapers written between the mid-1800s through the early 1920s a rich source of information about life as it was back then. The song Ka Maka’ainanaby Lilokela, was published in 1896. If it had a melody, it was probably lost over time. For a concert in California about the Hawaiian language project, Kellen put the lyrics to music using the lilting melody of a waltz, a popular mode of dance in those days. Although hula is based on a 4/4 rhythm and therefore very difficult to dance to the waltz tempo, Kumu Hula Eleena floated gracefully through this song that speaks of a love triangle metaphorically labeled Roselani, Lantana and Water Lily. Probably, the readers of that day knew exactly who these “flowers” were. The song ended with the repetition of what sounded like a gentle yodel. At the Kilauea Christmas concert in December 2016, Hoku Zuttermeister was the guest artist. He performed Lei Ana Kaua’i, written for Kaua’i by Frank Kawaikapu Hewett. The Del Rosario brothers, Reid and Mattie, danced the hula to this song at that concert. Mattie did the hula honors this night as his brother Reid was on the west coast. Kumu Hula Frank Akima is one of Kupaoa’s secret weapons. Right before intermission, Kellen and Lihau called on Frank, who stole the stage and brought the house down with his unique, comical and very athletic hula, danced to Mele Koki, composed by Puakea Nogelmeier. Based on the lightheartedness of the hula, you could not guess that Puakea’s message in this song is “wake up and protect your beautiful home from invasion!” Miniature Koki frogs, the worst intruders to invade formerly quiet Hilo, have been driving residents and visitors stir-crazy from sunset to sunrise because of the relentless chorus of 2 million of them singing in unison. Watch out for the cows in Kilauea, Kellen. Aunty Sabra Kauka did the honors of playing and singing Dennis Kamakahi’s Koke’e on the Kamoa ‘ukulele before the intermission. And after the break, the winner was … Ivory Shafer of Anahola. Congratulations! The next two songs Kupaoa sang were from their newest CD. Sweet Moonlight was written by Albert K. Kunuiakea, the illegitimate son of Kamehameha III, with music by Bill Kaiwa, and recorded with the Sons of Hawai’i. Frank and Puni danced the hula to Sweet Moonlight. Their good friend, Frederick Bruce Wichman, shared with them many kupuna stories about Ha’ena, an area rich in legends that Lihau incorporated into the lyrics and Kellen set to music. Nestled between Wainiha and Hanakap’ai, Ha’ena is memorialized in songs by many other composers. The song Ha’ena tells the story of Pohaku Kane, a large rock struggling to get to the top of the mountain. But Pohaku Kane kept slipping and each time had to struggle up again, only having to repeat the process again and again. When asked by God why he was trying so hard to get to the top, Pohaku Kane replied that if he could get to the top, he could see everything. In the 1800’s, the monarchy traveled to the U.S. and Europe to study. Consequently, they had a rich and sophisticated world view. They also wrote beautiful poetry and mele. Two of Lihau’s favorite composers were Queen Lili’uokalani and Prince Lelei’ohoku. Queen Lili’uokalani composed a vast repertoire of songs. One of Lihau’s favorites is Nani Na Pua, the first of the Queen’s songs to be published. As there were several versions of the song, they chose to record the 1897 “Ka Buke Mele O Na Himeni Hawai’i.” The ever so graceful Eleena danced the hula to this mele. Hawaiian Soul, recorded on their Bumbye album, was composed by Dr. Jonathan Osorio, who happens to be Lihau’s brother’s godfather. Osorio wrote it in memory of George Helm, a leader of the Hawaiian Renaissance at the time when Hawaiians struggled to gain control of the island of Kaho’olawe to stop bombing by the military. They crossed the channel from Maui and illegally occupied the island to stop the bombing. George Helm was lost at sea on one of his attempts to get back to Maui. Lihau’s chicken-skin rendition of the song captured the gravity of this pivotal event. In another huge surprise by Kupaoa, they invited the incomparable Mark Yamanaka of Hilo to the stage. He’d been here with them during the EKK 2015 season. He had been strolling around the ballroom incognito, trying to appear like a beach bum in his slippers and jeans, but when Kupaoa called, he came forward. Great balls of fire! That powerful falsetto of his filled the ballroom and you could feel a wave of excitement coursing through the audience. He sang the title tract of his two award-winning CDs Lei Pua Kenikeni and Lei Maile. Lei Kupukupu, composed by Dennis Kamakahi and recorded on their latest CD, is about the palapalai and pala’a ferns that hula dancers fashion into graceful lei for their heads, wrists and ankles. This was the hula that the dancers learned in the hula circle held at the start of the evening, taught by Puni, Frank and Eleena. What a beautiful gift of hula for the dancers and what a beautiful gift for the audience to witness, so many graceful dancers stepping up to the stage to dance a hula that they just learned. The brave ‘ukulele players learned the same song from Lihau and Kellen, and they broke out their ‘ukuleles to sing and play for the dancers. Ka Ho’okele, the title track for the CD by the same name, means “The Navigator.” It’s a song that pays homage to all the steersmen who guided them in this double-hull canoe journey, a metaphor for life. All the Ke ‘Ala Aumoe dancers joined the musicians for this final number. But…it was not their final number, because hana hou calls from the audience brought them back with Bumbye. In 2013, when Kupaoa, together with Puakea Nogelmeier shared their musical connections at EKK, Puakea told the story about how he came to compose Bumbye for his foster mother ‘Ululani, mother of Ku’uipo Kumukahi. Fearing for ‘Ululani’s life, for she would not drink any water, Puakea wrote this song for the “Queen of Bumbye” and sang it for her in the morning. She laughed at the lyrics, drank some water and was discharged from the hospital. It’s a tongue-twister of a song, but Kupaoa are masters at this. Puni, Frank and Eleena once again shared their hula to this song. This evening, packed with songs, hula, ‘ukulele, stories, surprises, food, fellowship and prizes, wrapped up with Hawai’i Aloha. 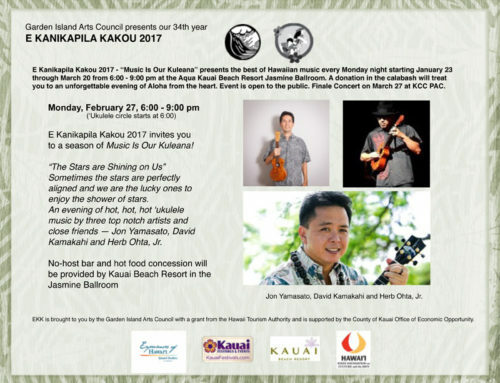 It was a happy crowd that bid each other adieu until next Monday’s EKK finale concert with Jerome Koko and Daniel Ho at Kaua’i Community College Performing Arts Center. What a rich 10 Mondays it will have been, and what a rich nine it’s been so far! 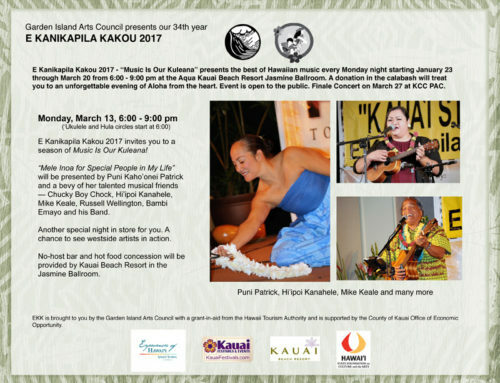 E Kanikapila Kakou 2017 Hawaiian Music Program is funded in part by the Hawai’i Tourism Authority, supported by the County of Kaua’i Office of Economic Development, the Kaua’i Beach Resort, and the GIAC/EKK supporters. Garden Island Arts Council programs are supported in part by the State Foundation on Culture and the Arts through appropriations from the Hawai’i State Legislature and the National Endowment for the Arts.